“The platform focus is to make sure I never hear the phrase, ‘There’s nothing to do here,’” Nalley says. Leisurlist users can log in and select from a list of 54 different interest categories that include music, shopping, yoga, volunteer opportunities, dining, theater, outdoor activities and many more. Once selected, users will receive a curated list of events, venues and insider recommendations tailored to their interests. Leisurlist’s primary audience is Northwest Arkansas young professionals between 25 and 44 years old, though Nalley says the website is also receiving traffic from neighboring states such as Texas, Oklahoma and Tennessee. Crystal Bridges Museum of American Art in Bentonville and the Walton Arts Center in Fayetteville are among local attractions that have partnered with Leisurlist. Nalley grew up about 25 miles southwest of Little Rock in Benton and is the daughter of two University of Arkansas alums. Her father, John Doyle Nalley, earned a marketing degree at what would later become the Sam M. Walton College of Business and is now a lawyer. Jerra Nalley, too, earned a marketing degree at Walton as well as a master’s. Her brother, Chance Nalley, is also a Walton graduate and practices law with their father. My family consists of: entrepreneurs and an adorable, spoiled cocker spaniel named Harley. The most famous person I have ever met: Chef Art Smith. My favorite music group in high school was: I’m always a fan of NSYNC, Backstreet Boys and the Spice Girls. A recent book I enjoyed was: The Last Mrs. Parrish. I would like to be known for: connections. I love connecting people with those who can assist them in any endeavor. Attending the University of Arkansas was a given in Nalley’s household. “We actually have a Razorback-shaped sink that my parents had custom-made in our basement,” she says. Nalley began her education at Walton thinking she would be a web page designer. That goal took a diversion when she attended her first marketing class with Marketing Associate Professor Dub Ashton. He burst into the classroom as music played, wearing a chef’s jacket that read “Kiss the cook” and talked about the marketing world. He made it seem fun and exciting. Nalley declared a marketing major. Economics Clinical Professor Robert Stapp inspired her to minor in economics – mainly so she could keep enrolling in his classes. She says his excitement for the subject was contagious. “I loved his classes so much,” she says. The same could be said for her honors colloquium class, where students had the opportunity to work on a smartphone app for Walmart and present the project to Tony Rogers, who eventually became chief marketing officer for Walmart’s U.S. operations. Nalley’s interest in social media continued to grow and be nurtured by Walton. The co-founder of Collective Bias, a shopper social media company based in Rogers, came to one of her classes to talk about social media. Inspired, Nalley introduced herself to him and asked about any job openings. They met for coffee, discussed social media and Nalley accepted a paid internship that led to a full-time job after graduation. She stayed there for five years, working her way up to senior account manager with clients that included ConAgra Foods, Coca-Cola and Hershey’s. Walmart, the world’s largest retailer based in Bentonville, then offered her a senior project manager position – just as she was enrolling in graduate school at the Walton College. 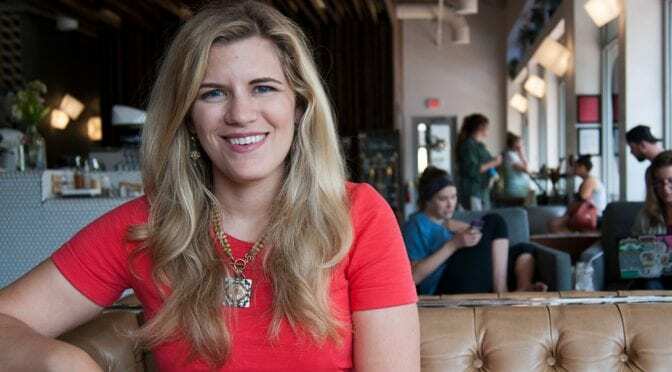 She juggled both school – even studying abroad in China – and her new job, where she managed social media strategy and recruitment marketing for Walmart’s campus recruiting, health and wellness and technology teams. When her passion for Northwest Arkansas became evident, her supervisors and she channeled it into recruiting. Nalley created a series of videos of associates sharing their stories about working for Walmart and living in the area. Nalley also created a weekly email of Northwest Arkansas events and recommendations that were sent out to associates, recruiting teams and new hires. The concept of Leisurlist was set in motion. In 2017, Nalley earned her MBA and left Walmart to work for the Runway Group, a Bentonville-based operation founded by Sam Walton’s grandsons, Tom and Steuart Walton, to attract and retain professionals in Northwest Arkansas. In doing research, she conducted a focus group of about 60 young professionals. Many told her they didn’t feel connected to Northwest Arkansas. Perhaps they simply weren’t aware of all the area has to offer, Nalley thought. “It’s great for families, but it’s also great for young professionals,” she says. With that thought, Leisurlist was born on December 8, 2017, with a customizable website, mobile app, social media channels and a weekly email update. Thousands of users have visited the platform and the number keeps growing weekly, Nalley says. As Leisurlist grows, Nalley is focusing on marketing campaigns, sponsorships and possibly expanding to areas beyond Northwest Arkansas. She’s also active in the community by serving on the Board of Directors for the Rogers-Lowell Area Chamber of Commerce and Main Street Eureka Springs, the leadership team for the NWA YP Summit and Advisory Board for Live479. This fall, she will also join Walton College Dean Matthew Waller’s Alumni Advisory Council and the Dean’s Roundtable of Entrepreneurs and Market-makers (DREAM). After all, there’s so much to do in Northwest Arkansas. Nalley is seizing the opportunities and sharing them. “I’m a start-up person at heart,” she says.